The top Angels prospect made a rapid ascent through the system last year -- his first full professional season -- as he climbed three levels and finished it with Double-A Mobile. Over that time, the 19-year-old hit .290/.355/.543 with 20 homers, 32 doubles, 77 RBIs and 83 runs scored. That performance earned Adell a second consecutive MiLB.com Organization All-Star nod, and the 10th overall pick in the 2017 Draft batted .391/.462/.478 with a pair of doubles and three runs scored in 11 games at his first big league Spring Training. However, Adell's spring came to screeching halt on March 9 when he suffered a Grade 2-plus right ankle sprain and a Grade 1-plus left hamstring strain during a game. The injuries will keep MLB.com's No. 14 overall prospect sidelined for 10 to 12 weeks. Assuming the timetable is accurate, that would put Adell back in action at the end of May, where he presumably would rejoin the BayBears. If the outfielder picks up where he left off, it would be no surprise if he is knocking on the door of The Show by Sept. 1. "Jo had a really nice full-season debut. Playing at three levels in a single season isn't what the average player goes through, especially at his age last year," Angels director of Minor League operations Mike LaCassa said. "Going forward, I think Jo is going to show us more of what we've seen from him, which is being an outstanding talent. He already learned a lot in his young career and right now he's recovering and doing really well. And we fully expect him to be at his best sooner than later." 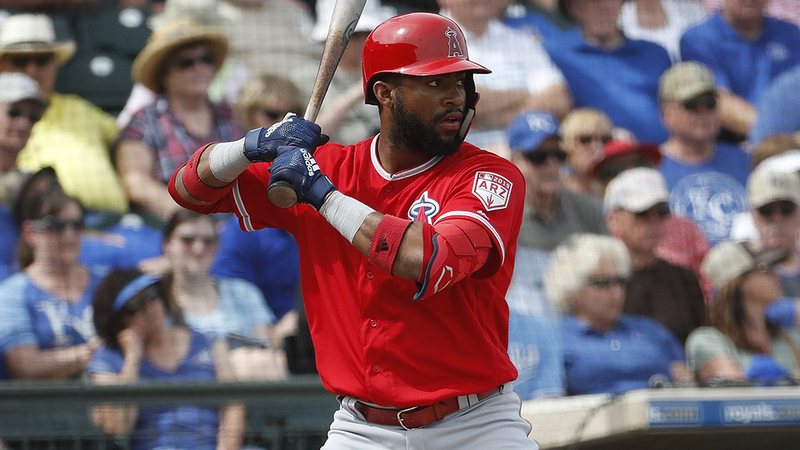 The second-ranked Angels prospect is another player on the fast track. Canning opened his first professional season with Class A Advanced Inland Empire and finished it by making 13 of his 25 starts with Triple-A Salt Lake. The 22-year-old did not absorb a loss in his first 12 pro starts while striking out 61 over 54 1/3 innings and sporting a sub-1.00 WHIP. Overall, the 2017 second-rounder compiled a 3.65 ERA and whiffed 125 over 113 1/3 innings. Ranked 63rd overall by MLB.com, Canning earned a non-roster invitation to big league camp, but the right-hander struggled with his command in three appearances, surrendering six runs on five hits and five walks over four innings. He will open the season in the Bees rotation but could see a Major League mound by the end of the year. "From the time that Griff got into the organization, he's been the ultimate competitor. He wants to take the ball and go deep into games," LaCassa said. "That's one of the things you notice about him right away -- his drive to compete -- and currently he has a pretty deep repertoire. He just needs to get more innings under his belt. He's pitched one full professional season, and to be in big league camp and begin in a Triple-A rotation is quite an achievement. We're very pleased with where he is at and his competitiveness is really going to lead to a lot of success for him." The Angels' No. 5 prospect took an almost identical path to the one Canning followed last year. In his full-season debut with the organization, Suarez began with Inland Empire and ended up making 17 of 26 starts for Salt Lake. Although it was his fourth season in the system, the Venezuela native was 20 years old, making him among the youngest players at Triple-A. The 5-foot-10, 225-pound southpaw posted a 3.92 ERA with 142 punchouts against 44 walks over 117 frames overall. Suarez also made his debut in big league camp and tossed an inning of perfect relief in his lone Cactus League appearance. He was added to the 40-man roster in November and could be the first called upon to fill in a void in the Angels rotation. "He goes out there and pitches with a lot of confidence. He's got as much confidence as anyone in our system," LaCassa said. "He's also a very good athlete and he's very strong. Whenever he takes the mound he has a pitbull mind-set." Adams was selected 17th overall in last year's Draft and immediately showed flashes of what made him a two-sport standout at Green Hope High in North Carolina. The Angels' No. 6 prospect could have continued his path as a football player but chose baseball after Anaheim offered him an above-value bonus. In first professional season, Adams hit .243 with a pair of triples and doubles and five RBIs in 20 games in the Rookie-level Arizona League. His 80-grade speed was on full display as he stole five bags in seven tries. The 19-year-old was promoted to Rookie Advanced Orem, where he posted a .314/.375/.486 slash line with five extra-base hits in nine games before suffering a broken jaw in an outfield collision. "Jordyn is an exceptional athlete and competitor. He's extremely confident and rightfully so," LaCassa said. "He has a lot of tools and they're all weapons. Right now, the focus will be to continue to provide Jordan with the resources to learn about the game and grow in all the different areas." Signed out of the Bahamas in July 2017, Knowles made his pro debut in the Arizona League last summer and batted .301 with six extra-base hits -- including a dinger -- and seven steals in 30 games before being promoted to Orem. The 18-year-old showed a well-rounded game with the Owlz as he patrolled all three outfield positions with ease and posted a .321/.398/.550 slash line with 15 extra-base hits, 15 RBIs and 13 walks as a switch-hitter. His versatility, above-average tools and emerging power could help him become another fast riser in the system. "It's easy to forget how young some of these guys are. D'Shawn just turned 18," LaCassa said of the organization's 10th-ranked prospect. "He's coming off of his first pro season and he played at two levels and performed well at both of them. We're very excited about the player he is and could become, and he has a development plan right now that he needs to continue to focus on -- which he does, day in and day out -- that will help progress all components of his game as a player." Deveaux was signed on the same day as Knowles, his Bahamanian countryman. There must be something in the water because Deveaux also can fly. The 18-year-old has 80 grade speed, which was apparent during his first pro season in the AZL. The No. 17 Angels prospect hit five doubles and a homer and stole seven bags in 44 games. He also showed the ability to become a plus-center fielder with his instincts and blazing speed. "His speed tool is a special one," LaCassa said. "He's one of the most athletic players in the system, and that's saying a lot because we have a lot of high-end athletes here. His speed really showed up in play, whether it was tracking balls down in the gaps or on the bases as well. We saw a lot of growing from Trent last year, his instincts really improved in all areas, he just needs to play more." More to keep an eye on: No. 21 prospect Jared Walsh added a wrinkle to his game by becoming a bullpen option, and the decision is benefiting the now two-way southpaw. He was another three-level climber who finished last season in Salt Lake. The 25-year-old impressed at big league camp by going 5-for-19 with four doubles, five RBIs and four walks at the plate while holding opponents to a .143 average and striking out four over 6 1/3 innings in six relief outings. Eighth-ranked Luis Rengifo, another three-rung climber, will start the season in the Pacific Coast League and is a prime candidate to make his big league debut this year. No. 3 Brandon Marsh (No. 3) and Jahmai Jones (No. 4) shouldn't get too comfortable with where they open the season because they could be on the move quickly.